Rare Opportunity in Pembroke Court! Four Bedroom Home For Sale in Prairie VIllage KS! Brookside Two Story Home Close to Shops! Classic Rockhill Gardens Tudor Home For Sale! Two Story Home in Verona Hills For Sale! Move In Ready Two Story Home in Desirable Kensington Valley! Updated Two Story Home With Pool in Pinehurst Estates! Distinctive Brookside Home For Sale ! Landmark Brookside Home For Sale! Beautiful 4 Bdrm Home in Fairway Kansas! 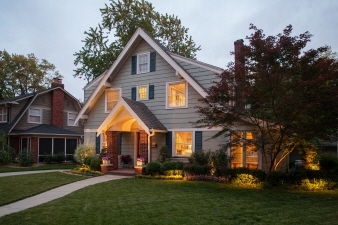 Beautiful Old Leawood Home--All Updated! An architectural designer lives here--come and see what she's done! This home was featured on the 2009 Remodeled Homes tour. Simply elegant, inviting, warm and comfortable. Special features include: updated eat-in kitchen, dedicated office with build ins, second floor laundry room, finished basement, private backyard with 2 tiered deck, two car garage. A truly beautiful Brookside home--see it today! Interior Features Harwood floors, arched doorways, updated kitchen and baths, dedicated office with built ins, finished basement, second floor laundry. Additional Features and Amenities Closet organizers, eat in kitchen, formal dining room and living room, family room.